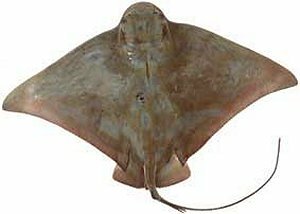 Skate is native to both the Atlantic and Pacific coastal waters, the term or name simply refers to any type of “ray”. Skate can reach upwards of 100 pounds. Skate must first be soaked in a vinegar or salt solution before preparation, this removes any ammonium flavors that can develop after capture. Skate can be sautéed, poached or baked. It is a favourite fish in France where it is often prepared with brown butter. Skate with Capers - Skate wings, butter, capers in vinegar. Pan Fried Skate with Capers - Boneless skate fillets, milk, pepper, flour, butter, sweet red pepper, capers, shallots, red wine vinegar, parsley. Skate Salad - Skate wing, basil, parsley, rocket, court bouillon, capers, black olives, cooked new potatoes, lemon, sea salt. Skate with Lemongrass, Ginger, Orange & Lime - Pan ready skate fillets, fresh lemongrass, fresh ginger, orange juice, lime juice. Skate with Olives, Capers & Cherry Tomatoes - Boneless skate fillets, olive oil, Sicilian olives, cherry tomatoes, capers, garlic. Skate Wings with Orange Sauce - Skate wings, oranges, lemon, mint, potatoes, rock salt, pink peppercorns. Skate Wings with Sun Ripened Plum Tomatoes - Skate wings, plum tomatoes, banana shallots, garlic, anchovy fillets, thyme, bay leaves, sugar, olive oil, flat leaf parsley, onion, carrot, leek, peppercorns. Skate Wings with Crabmeat - Skate wings, semolina, lump crab meat, aioli, scallion, arugula, pecan nuts.